And so Mina writes and writes in her notebook, and here is her journal, Mina's life in Mina's own words: her stories and dreams, experiences and thoughts, her scribbling and nonsense, poems and songs. Her vivid account of her vivid life. 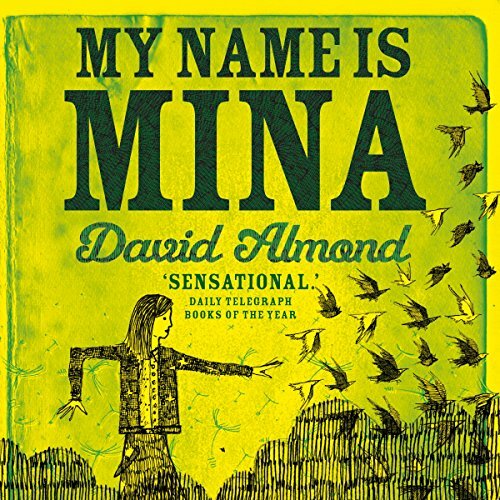 In this stunning book, David Almond revisits Mina before she has met Michael, before she has met Skellig. Would you listen to My Name Is Mina again? Why? What other book might you compare My Name Is Mina to and why? Okay for Now - Gary D. Schmidt - which is also about a boy struggling to find out who he is. Too many wonderful bits to count. She's a delightful character...delightfully portrayed. I didn't want the story to end. Mina lives with her mother and she loves sitting in the tree in her front yard. The view from her tree is “extra-ordinary”! Sometimes there are baby birds and other beautiful and amazing things she can see from the tree, but most of all, Mina loves the night. Even though Mina bubbles with optimism and joy, her life has not been easy. Her grandfather who used to send her treasures from his travels has given her his last gift, she has a lot of trouble fitting in at school; finding friends and living up to teachers’ expectations, and she misses her dear dad who died. Mina is trying to figure out how to be herself and still find a place in the world around her; luckily her surroundings are brimming with surprising possibilities. If you like books about young people who have trouble fitting in, you might also enjoy Deliver Us From Normal, by Kate Klise, or Anything but Typical, by Nora Raleigh Baskin, or Stargirl, by Jerry Spinelli. This is the companion book to Skellig, by David Almond, if you are home you can watch this youtube book trailer about Skellig. I loved every minute of this, this...I dont know what to say except work of art, but I dont want to say that because its cheesy and i should be able to describe it better and I would be able to do that if I had been different and had a patient amazing mother like Minas, but I didn't and thats not to say that I dont love my mother to the end of the world and beyond becuase i do, and always will so its ok that she didnt talk about the ancient gods, life after death, how parts of us fly up in the sky and enter other people and the underworld and many more amazing things that Minas mum does because Im not Mina and I most likely would have looked at her funny so Im just very happy to have been able to see a sliver of her life and heard it narrated by an amazing story teller with expression, character love and laughter which you dont get often in an audiobook so all i can say, after all that preamble is that i loved this book, and i think you will too, and i hope one day my daughter will read it and will love it as much as i do and then we can go on a walk to where our feet take us and she can maybe pickup a pencil and write to the bottom of the page without finishing a sentence. If you could sum up My Name Is Mina in three words, what would they be? mina was my favorite character becouse she was like me. She loves the moon and the night. And she is a lovely girl. What about Charlie Sanderson’s performance did you like? His performance was great and he has the perfect voice for the part that he playes. an amazing heart warming story perfect for the howl family to enjoy. The best book iv ever read. My name is mina is one of the best books i have ever read. I cannot recommend highly enough the recording of this book. The narrator sounds like a child, reads it in the most amazing fashion in the correct accent (or near enough as doesn't matter) and makes fabulously interesting, funny and moving what might seem peculiar on the page. The narrator really gets it! I would listen again in an instant if I were travelling again today.